Ottawa is lucky to have at least four authentic BBQ restaurants in the area: D&S Southern BBQ on Russell Road in Carlsbad Springs, Fatboys Southern Smokehouse on Murray Street and The Smoque Shack on York Street. 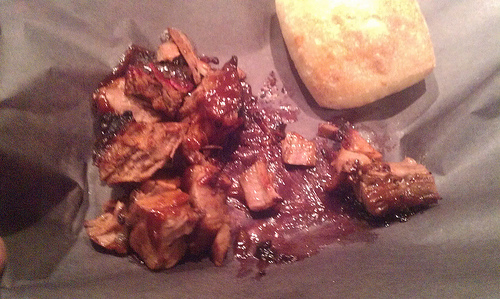 There is also a new place on Bank Street in the Glebe, Annie and Clyde's Southern BBQ. As my fiance was spending Saturday with her bridesmaids getting their dresses sorted out, I decided to grab a few buddies and see if I could visit D&S, Fatboys and Smoque in the same day. It turned out to be quite the adventure. Each BBQ place is different and if you know BBQ, then you know there are many different preparation methods, sauces and rubs that go into BBQ, making it a very personal thing. If you're not sure which one you'd like to visit, do what I did - visit them all. D&S is about 20 minutes East of Ottawa but it's not that hard to find. Get off the 417 by making a left on Boundary road and follow it until you get to the junction with Russell Road and you'll see it. They have ample parking for cars and snowmobiles. The restaurant is large with lots of comfortable seating for families and so I'd say that D&S is really the best option for people with family because the combination of parking and seating make it perfect for people with children who can't afford to spend the time it takes to get the minivan parked downtown. If you are bringing kids, be sure to have something to occupy them as our food did a bit of time to arrive. But hey, if you want fast food, go to McDonald's. The food at D&S is really good. Everything is big. They even have a 5.5 pound "burger" called "The Determinator". If you eat it in 1 hour, you'll get yourself on the D&S Wall of Fame. 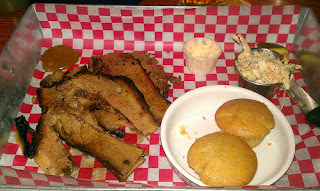 We had brisket, pulled pork, ribs and wings with sides of coleslaw and cornbread. The brisket was really good. The sauce you can see on it in the picture was really tasty. 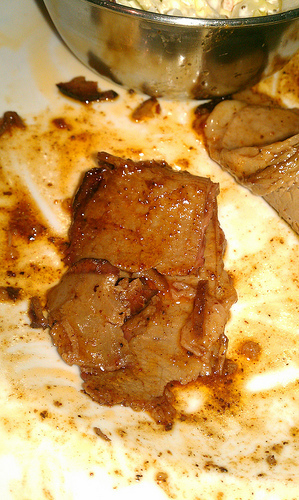 They slice their brisket thinly and there is a nice layer of fat (flavor) on it. The pulled pork was sweet and juicy and the ribs were tasty and tender. Now, some people will say that D&S' ribs aren't fall of the bone and that's the way they designed them but that doesn't mean they aren't tender. The cornbread was amazing. It's not as "mealy" as other places, more like a muffin but still, it was really good and worth ordering for sure. Located on Murray Street near Sussex you'll find Fatboys Southern Smokehouse. I should start by saying that I went to Fatboys on the day that it opened wasn't overly impressed. The brisket was dry, the ribs were small and the sides were dry and unimpressive. Here's Ottawa Citizen restaurant reviewer Ron Eade's thoughts on Fatboys at opening. I was pleasantly surprised to find out upon my most recent visit that they fixed all of these issues, and then some. The brisket was nice and thick with a huge layer of fat on the top, the ribs were juicy and tender and the sides were really good. They also have amazing little cornbread bites that are addictive. One my buddies said the ribs were the best he'd had since The Salt Lick in Austin Texas. That's high praise for sure. Fatboys also has amazing sauces and if our server wasn't 6'5'' and over 300 pounds, I would have stolen some as the store won't be up and running until the Spring. Fatboys is a large open space with plenty of TV's, tables and beer paraphernalia. The decor and the details are really impressive and you can see that they spared no expense renovating the space that used to be a flower shop. Fatboys is the place you go with a group of friends to drink beers and have fun watching some sports or, if you're there on Friday or Saturday nights, the live music. The final stop on our tour was The Smoque Shack. It's on York Street, East of Dalhousie. I have been to Smoque a few times before and I knew it was good so it served as my "safe bet" for a place I knew we'd love. If D&S is a place for families and Fatboys is a place to party, Smoque is a place for those of you who are serious about food. Warren Sutherland who used to be at Sweetgrass knows his way around a kitchen and despite being a super nice guy (he had seen that we were touring BBQ places on Twitter before we arrived) he cooks up some mean BBQ in his smoker. The first thing you need to know is that anything jerk at Smoque is off-the-charts good. We had jerk wings and jerk pork, both of which were simply amazing. Of course, I had brisket and it was also really good. Smoque does brisket a little different than everyone else. First, they chop it up and then they finish it off with a coffee BBQ sauce. The best part is the small bits of burnt crust (called bark in BBQ circles) are to die for. Smoque has an atmosphere that is a mix of traditional and modern and the bar is stocked with amazing local microbrews. Many thanks for the bartender for pointing us towards Mill Street's seasonal 9% Belgian hopfest that is called Beetlegeuse. Eating BBQ is fun and we had a great time visiting each of these establishments. Ottawa is in a great place right now. There's an epic battle going on for our BBQ hearts and minds and we are ultimate winners. Even mediocre authentic BBQ is better than what you'll get at the large franchises so I would encourage you to get out and try these places. Just do me one favour - don't complain about the lack of place ware to your server. BBQ is a contact sport and so it's not about forks or plates. In fact, I prefer mine without either of those things. It's been a busy 2012 so far for me and I'm really happy to announce that the first episode of IABC Ottawa's podcast "The Voice" that I am hosting has been posted on the IABC website. I have always been a fan of podcasts and listen to upwards of 5 to 10 of them a week, so it was a no-brainer when IABC Ottawa asked me to take over co-hosting duties from Jud Rasmussen who didn't have time to give it the attention it deserved. Jud is a close family friend of mine and I wanted to make sure that I tried to keep up the amazing quality he established over the past year. For my first episode, I decided to talk about Peer to Peer Marketing with my buddy Jackson Wightman.